Large-scale construction is about to start again in Grangegorman with today’s announcement by the Minister for Education and Skills Richard Bruton TD, the Minister for Finance & Public Expenditure and Reform Paschal Donohoe TD and the Minister of State for Higher Education Mary Mitchell O’ Connor that the PPP agreement has been signed for the building work on the new Central and East Quads. These two state of the art new buildings, once complete, will provide a new home to over 10,000 DIT students and staff. This is over half of the overall number of students studying in DIT. The Quads are being constructed by the Eriugena Consortium, which includes Irish construction company John Sisk & Son (Holdings) Ltd. and Spanish construction company FCC Construction (Ireland) Ltd.
Welcoming the signing, the Minister for Education and Skills, Richard Bruton, said,“Today’s signing represents a very significant step forward in realising the Government’s ambitions for the Grangegorman development and in delivering a consolidated, state of the art campus for DIT. This significant investment in higher education infrastructure will also advance Ireland’s ambitions to provide the best education and training service in Europe by 2026. Minister for Finance and Public Expenditure and Reform, Paschal Donohoe, said “The very positive impact the Grangegorman development is having on the surrounding areas of inner city Dublin is already very evident. Today’s announcement represents a significant step forward in realising the full potential of the Grangegorman site as a hub for high quality education and health facilities, as well as for community activity. 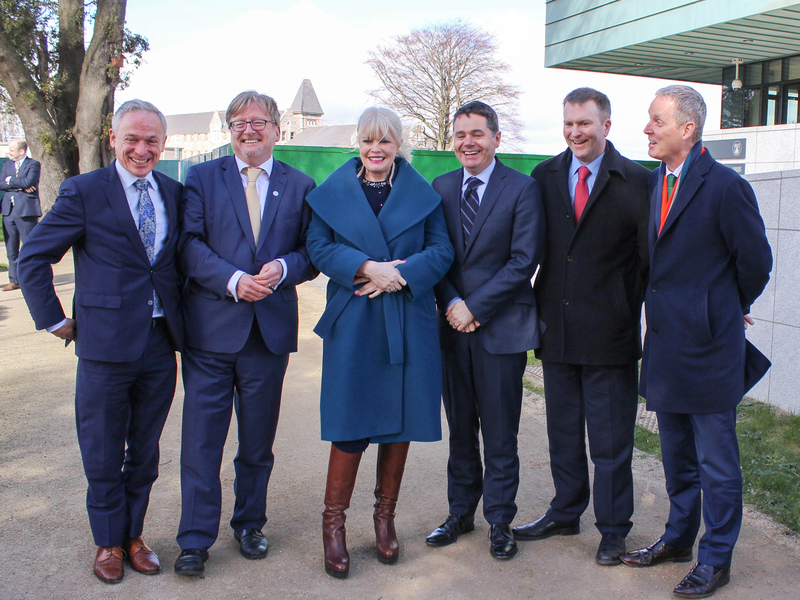 Minister of State for Higher Education, Mary Mitchell O’Connor, underlined the significance of today’s announcement in the context of DIT’s plans to become a Technological University, together with IT Tallaght and IT Blanchardstown. The Minister said “The Technological Universities Act, which has been a significant priority for this Government, was passed into law on 19 March. This is a major milestone and implementation of a significant commitment in the Programme for Government. It gives a renewed impetus and welcome certainty to the consortia planning to seek TU status. It will underpin the development of a new type of higher education institution. The Central Quad will accommodate academic activities and facilities required for a total of ten schools from the College of Sciences & Health, College of Engineering & Built Environment and the College of Arts & Tourism. The East Quad will accommodate the majority of academic activities and facilities required for the College of Arts & Tourism which currently consists of six schools, four of which will be accommodated within the East Quad building. Both of these new buildings are set for completion and occupation in September 2020. They will add to the changing landscape of the new Grangegorman quarter, which already includes the Phoenix Care Centre, the Grangegorman Primary Care Centre (opened this year), the Greenway Hub, the new playing pitches, playground and walking/jogging track. With work now beginning on the Central and East Quads the GDA will aim to keep the project progressing with the design of the new Academic Hub and the HSE Residential Care Neighbourhood, and the submission of the planning application for the new Dublin 7 Educate Together School on the site.